A completed RPSU board fitted into an Oakley SRE330 rack ensemble module - the optional power on LED parts have not been fitted here. The Oakley Rack Power Supply Unit (RPSU) is a split rail power supply design that has been designed to power our SRE330 rack module and other projects. It will supply a well regulated +/-15V although it can be simply altered to supply any split rail voltage from 5V to 20V. The amount of current that the unit can deliver is dependant on the AC power source, the choice of smoothing capacitors and the heatsink used. It is expected that the RPSU be fitted into a metal case and the case used as a heatsink for the two power devices. For safety reasons it is suggested that the unit will be used with an external single phase wall-wart (plug top adapter) or centre-tapped linelump (in line mains adapter) such as the Yamaha PA-20. This ensures that all high and dangerous voltages are kept out of your module's enclosure. It is possible to use a standard transformer with the RPSU. But note, a component level mains transformer should only be used if you know how to connect high voltage wiring. On no account should this project be powered by a component level mains transformer if you are not familiar with fusing, earthing and safe connection of high voltage equipment. For safety reasons Oakley Sound can only endorse using this module with a low voltage input from a suitable plug top or inline power supply. The power supply uses standard parts throughout and requires only a simple voltmeter to test. The circuit board takes less than an hour to build. Various options are available for different types of switching, earthing and power on indication. The strong glass fibre PCB is silkscreened for easy component identification. It uses generous pad sizes, through plated holes for easy soldering and wide double sided copper tracks for reliable operation. The unit features two 0.156" headers for the outputs. PS1 can be either four (or five) way and carries +15V, 0V, 0V, -15V, (ground). PS2 is a three way header and carries +15V, 0V, 0V. PS1 when fitted with a four way header is MOTM compatible. The board size is 150mm (width) x 50mm (depth). All of the other parts should be able to be purchased from you usual electronic component supplier. Please see the Builder's Guide for more details. 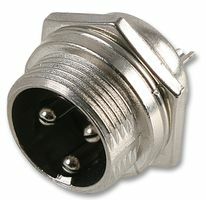 The three pin power socket for use with external PA-20 and PA-30 power supplies.